When an order has been completed it is not possible to add or modify the order. For more information, please refer to our Customer Service page . The order has just been completed and will be evaluated to ensure that the object(s) are printable. The 3D printing process has started on the object in a printing cycle : your 3D file has been sent to one of our high-quality 3D printers. Your 3D print(s) have passed our quality control and the items are being packed and prepared for dispatch. There will confirmation that your 3D print(s) have been dispatched with the transporter and where applicable the tracking number will also be confirmed. This is when the 3D printing center needs to make additional checks on your 3D print(s) before the 3D printing can commence. If there are objects that do not respect the minimum 3D printing requirements for the chosen material then the objects will be shown as “cancelled”. For instance 3D print polyamid requires a minimum thickness from 0.8 to 1mm depending on your object. To learn more, you can refer to our materials design guidelines . A separate email will be sent to you to confirm the reason why we were forced to cancel the object(s). For more information on delivery dates, you can go on our delivery times and prices page . If an object do not pass our quality control check, the estimated delivery date may change. There could be a change in the estimated delivery date due the objects did not pass our quality control check. In fact, all of our objects go through a quality control check before they are packed for dispatch. Due to the different requirements for each 3D printing material there can be some objects that would not be to the customers satisfaction, we prefer to refuse these objects and start the 3D printing process again. In the unlikely event of there being this issue with your object(s) the 3D printing status bar will start from the beginning. 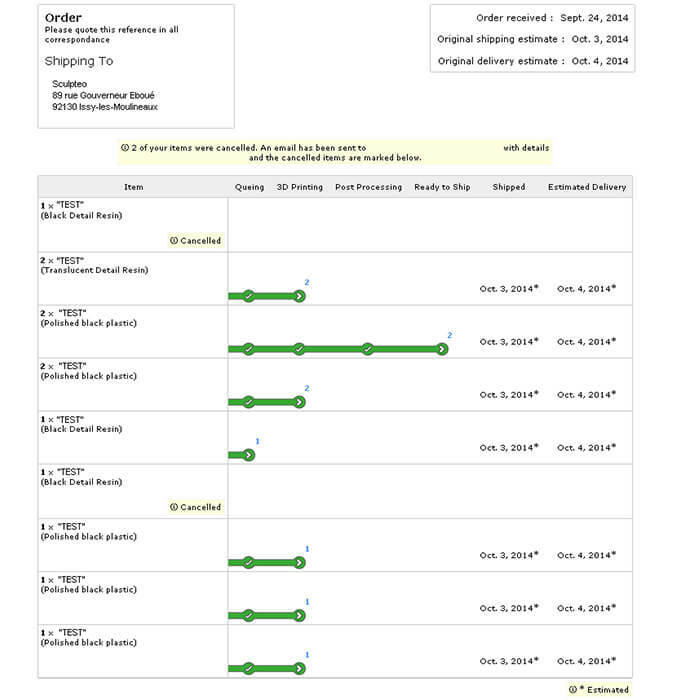 When your object is dispatched with the delivery courier, there will be a date shown at the end of the status line underneath “shipped”. If you choose a shipping method which offers a tracking option, a tracking number will be given to you. Then you will be able to track your object as it is shipped to its destination. Haven't found the information you're looking for? Contact us using our contact form . We'll get back to you right away.